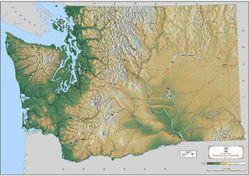 This is a beautiful shaded relief map of Washington highlights the terrain of the state. Shows elevations, valleys, peaks, rivers, etc. using shades of green and brown to create a great visual wall map for the state of Washington. Available in 2 sizes. Paper or laminated.